You and your family have visited the High Country and are considering making one of the numerous gorgeous communities your new home. Congratulations! The friendly folks at Antler Realty services many Blue Ridge Mountains communities to help families like you navigate the Banner Elk NC real estate market. Antler Realty focuses on Beech Mountain real estate along with Sugar Mountain, Linville, Seven Devils, Matney, Boone, and Valle Crucis and Banner Elk real estate. Our staff has a whopping 65 years of combined real estate experience and knows the High Country extraordinarily well. With our office location nestled snugly in downtown Banner Elk, we can attest to the excellent amenities the town offers. We attract people and families of all walks of life and are eager to help you settle into your new pocket of happiness. Seasonal visitors may be familiar with the area, but our agents’ decades in the High Country will help ensure that you’ve chosen the right community. Our seasoned staff of agents have been meticulously selected based on their strong work ethics, experience and enthusiasm. With these combined skills, Antler Realty is proud to be the perfect group of people to guide you through the Banner Elk NC real estate market. Out of your numerous options, why choose Banner Elk? The number of world class accommodations to choose from, including world-class restaurants and unique shops found in town, make Banner Elk very entertaining within the town limits. The surrounding communities offer many High Country activities such as golfing, horseback riding, rafting, fishing, skiing and much more. Visit the best known example, Grandfather Mountain: the only private park in the world that is designated by the United Nations as an International Biosphere reserve. The agreeable and refreshing spring and summer climate of the High Country is a major draw to the area. Leaves change in a fantastic display of color during autumn, a season featuring several exciting art festivals. Winters boast the breathtaking beauty of the snow capped mountains, an idyllic getaway for skiers. Whether you are looking for a luxurious mountain cabin in a gated community or would love a modest cabin close to town, the folks at Antler Realty have the state of the art technology and best marketing tools available to help you find your perfect home within Banner Elk NC real estate. Our passion for the Blue Ridge Mountains and competitive real estate skills are what will smoothly usher your family into mountain life in the High Country. 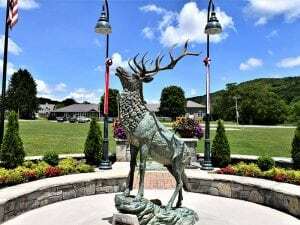 You visited Banner Elk and adore the area…is it time to stay?